Garlic has many benefits, such as curing a number of ailments that affect the lungs, stomach, and throat; assisting with weight loss; and even preventing cancer. It might surprise you to learn that growing your own garlic is quite easy. Not only can you enjoy the health benefits for your lungs and other vital organs, but you’ll also have plenty of homegrown garlic on hand to add to your fresh-cooked meals. It’s the ideal plant for gardeners who are just starting out since it will grow in any climate and planting it is easy; just buy a bulb and plant it in some dirt. 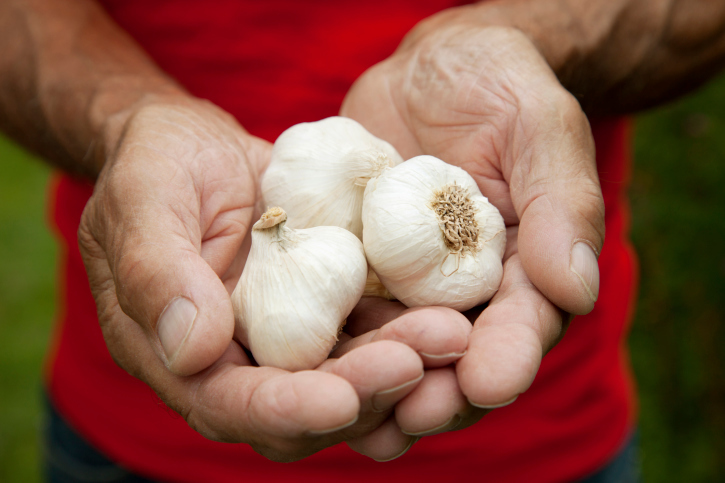 Once you start growing your own garlic, not only will you enjoy deliciously seasoned food, but you’ll also enjoy the health benefits, such as an improved immune system. For optimum results, garlic is best planted in the late fall, approximately three weeks before the ground freezes. I also recommend using organic garlic bulbs, such as the ones that can be purchased at a farmer’s market. If planting your garlic in a garden, add a layer of compost or manure a few weeks before you plant your bulb and add a layer of mulch, such as straw, after you plant it to keep the bulb warm. Break the garlic bulb into separate cloves and plant each with the root facing downward. Place each clove approximately six inches apart. When spring rolls around (and before the ground freezes in the fall), water your garlic about three times a week. However, you should stop watering your garlic about three weeks before it reaches maturity in mid-July. The garlic should be ready to use in food and for health supplements around mid-August. Use care when harvesting your garlic, as garlic tends to bruise quite easily. Use a narrow shovel to loosen the dirt and carefully lift the garlic bulb out of the ground by hand. If you’re harvesting a large amount of garlic, you’ll have to cure (dry) it. This can be done by hanging it in a dry place. If you happen to have purchased garlic at the grocery store while waiting for yours to mature, hold onto the mesh bags it came in. You can reuse these to store your garden-grown garlic in, as circulation keeps the temperature stable, extending the life of your garlic. Now that you have your own garlic, you have an affordable way to spice up meals and improve the health of your lungs and other vital organs. Garlic is also loaded with antioxidants. If you suffer from skin conditions, such as psoriasis, athlete’s foot, or cold sores, garlic oil also provides an effective treatment. Garlic truly is an effective natural remedy!